For Save The Snakes’ 2018 World Snake Day Donation Campaign, Animal Equipment By Stoney LLC graciously donated snake hooks and snake bags for our Snake Rescue Teams in India! 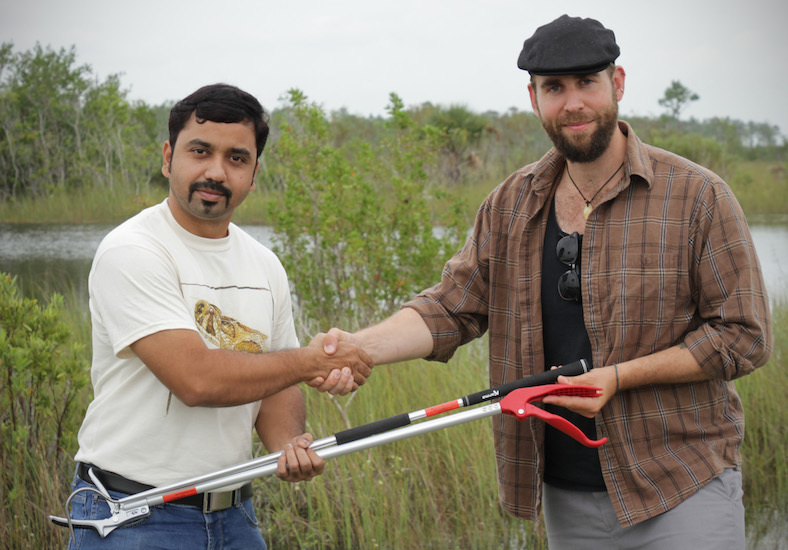 When the Save The Snakes Team met at the 2018 Venomous Herpetology Symposium in Miami, Florida, this equipment was delivered to Save The Snakes Co-Founder Murthy Kantimahanti. We greatly appreciate Animal Equipment by Stoney’s support and proudly recommend their excellent products! Stoney McDonald of Animal Equipment by Stoney has been building quality capture equipment for more than two decades. He loves his work and it shows in the quality of the products he produces. Now, as a small business owner, he brings his passion for building directly to customers, offering top-of-the-line animal capture equipment at competitive prices. Next Post The 2018 Venomous Herpetology Symposium was a Huge Success!